In early August, several Columbus area food writers and bloggers were invited to The Inn at Cedar Falls for a day and night of hospitality. Considering that blogging is largely a pro-bono enterprise, having a night on the house with great food and fine lodging was a treat I could not refuse. 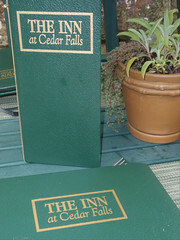 Also, the Inn was one of the last checks on my list of Dine Originals Restaurants where I have not dined. 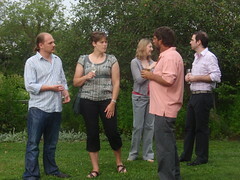 I enjoyed the company of my companions, all are friends or colleagues made since I started blogging. Spending an evening with people that are as passionate about food and drink as I am is a special treat. Each of us documented our experience in one form or another. I gathered podcast content for – Columbus Foodcast – Episode 46. 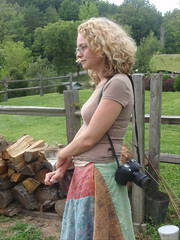 Becke aka Columbus Foodie beat us all onto the web with a great post and photos of our trip. 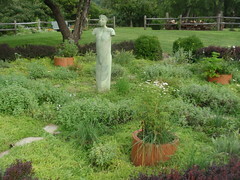 There was also a Woolf in the southeast Ohio woods – Hungry Woolf documented our dine and added in a contest to win dinner for two (sign up before August 31st). Walker and Anne from Columbus Underground, Kristine Eley (on Ratebeer.com) and Jill Moorhead, 1/2 of Itinerant Foodies as well as the magician of marketing at Hills Market, rounded out our party of eleven. We segued to dinner. 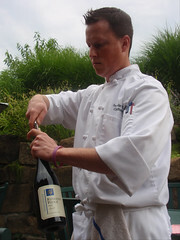 Anthony Schultz, chef of the Inn, greeted us with wine. The bar features Kinkead Ridge wines from Ripley, Ohio (which is the Ohio wine favorite of many in our party) as well as Jackie O’s beers from Athens, Ohio – a favorite of mine as well as Kristine. Dining with a pack of food writers can be intimidating for a chef or restaurant owner – in constant fear of being thrown to the hungry wolves. However, my heart goes out to the spouses, significant others and friends who joined us because the first rule of dining with a writer is – wait. 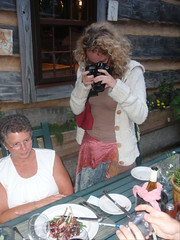 As soon as any plate hits the table it is photography time. Cameras appear for multiple shots as we try to get the light right, juxtapose ourselves for good angles, and consider a host of other elements for the food photos. This can take awhile, especially when your dining companions are hungry. An unwritten rule, which serves as a litmus test for all who enter our lives, is sharing. 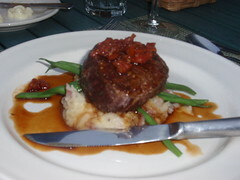 We order different menu items on autopilot, afraid that we might miss out on the best entree or appetizer. Forks fly across the table for samples, beverage glasses are communally-sipped and desserts are dissected. This is how we roll but it is not for the faint of heart or weak of stomach. We wrapped up the night around a fire talking about food, travel and traveling for food while imbibing our favorite wines and drinking some hard to find beers courtesy of Kristine (thanks for the New Glarus). These are people I often cross paths with in the course of my avocation. However, on this night I had a chance to stop, sit down and enjoy the company of my Columbus online food community friends in person before, during and after dinner. This entry was posted on August 17, 2009 at 11:21 PM	and is filed under food, Ohio, restaurants, Road Trip. 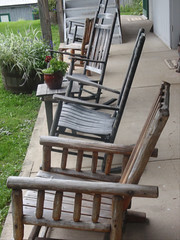 Tagged: Hocking Hills, The Inn at Cedar Falls. You can follow any responses to this entry through the RSS 2.0 feed. You can leave a response, or trackback from your own site. Had a blast hanging out Jim… and if you ever want to organize a smaller beer tasting, let me know as I have more where that came from! 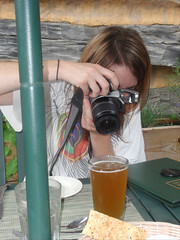 CMH G Comment: (That is a great offer – Kristine does beer tastings at Hills Market and Surly Girl Saloon). Someday, I will get a sitter and make it out of my home past the hour of 8 pm without a child in tow. Looked like a fantastic time. Nobody eats till we get a picture – I know that one.